the Old product (Fig. 423 a). Dress semi-fitted silhouette, cut at the waist, sleeve vtachnoy, made from knitted fabric. Size 158 - 88 - 96. New product (Fig. 423 b). Two of the bathing kit. Size 158-96-104. Construction drawing of the model (Fig. 423 b). Melting (Fig. 424). In the drawing need the following measurements: St - 38 cm; SB - 52 cm, Pb = 1.5 cm (the Increase in free fit for all sizes). First issued back half. Builds a right angle with the vertex at the point A. From point A down is the period equal to 0.4 measurement poluobhvat hips (SB) plus the increase in free fit, and put a point B. From point B to the right is the horizontal line of the hips. From point B down is delayed a period equal to 0.4 measurement poluobhvat hips minus 2 cm, put the H-point. From point T down a vertical line 2 cm below the hip line. The point of intersection with the line of the hips is indicated by the letter B1, at the end of the segment is point B2. From the point N to the right is the cut equal to 0.1 measurement poluobhvat hips (SB), a dot D1. Point H1 and B2 are connected by a straight line from the middle of which is restored to the perpendicular, is equal to 1 cm 1 - 2 = 1, see Point H1, 2, B2 are connected by a smooth curve. To build the front half of the point And down is the segment AB, is 22.3 cm From the point B to the left is the horizontal line of the hips. From point B down is delayed a period equal to 0.2 measurement poluobhvat hips, a dot N.
From point N to the left draw a horizontal line on which is deposited a cut equal to 0.1 measurement poluobhvat hips, a dot D1. From point T down a vertical line that crosses the hips and extended beyond it by 2 cm, a dot B2. 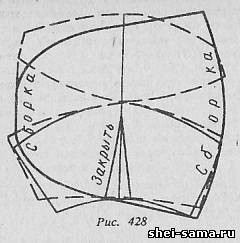 Б1Б2 = 2 cm. From point B3 to the left is the cut of 2 cm, a dot b. Cut Н1Б3 is divided into three parts, from bottom of the division right is restored to the perpendicular length of 0.3 cm. the Point B2, 3, b, 4, H1 connected with a smooth curve. From point A down the vertical line delayed 1.5 cm, a dot A1. The resulting point of a smooth concave line connects to the point T.
The design drawing of the front and rear halves of the bottoms at a distance of 5 cm from the waist line parallel to the line held (low waist line), the intersection of which with the side sections is designated by a point T1. Т1Т3 = 2, see Point T3, T2 connected with a straight line. Builds a right angle with the vertex at the point A. Down vertically is the cut equal to the height of the breast and put the H-point. An = 19 cm From point N to the right draw a horizontal line. From point A to the right horizontally is the cut equal to the width of the breast, is the point B. AB = 21 cm From the point down In a vertical line. Crossing it with a horizontal line indicated by the letter H1. From point A down the vertical deferred period equal to half the height of the breast minus 0.5. AB = 1/2 X an - 05 = 19/2 - 0,5 = 9 cm. From point B to the right draw a horizontal line, its intersection with the cut ВН1 is indicated by a point B. the Segment AB is divided in half, from the middle to the right is deposited 1 cm, put the point O. From point O down a vertical line its intersection with the line BV is denoted by O1, with a line НН1 - H2. The segment AB is divided in half, and put the point B1. AB1 = B1B. From point B1 up vertically is delayed 1.5 cm, a dot B2. Б1Б2 = 1.5 cm straight connect Auxiliary points B1, A1 and B2 On the interval Б1О1 from the point B1 is delayed 1 cm, on the interval Б2О from point B2 - 1.5 cm Obtained points connected with a straight line. From a point in upward delayed 3.5 cm and put the point B1, then another 2 cm and a dot B2. Accessory direct connect points A1, B1 and B2. On a segment Ов2 from the point B2 is deposited 1 cm, the resulting point is connected with a straight line from point B1. From the point D1 on the line Н1Н is deposited 2 cm, a dot H4. Н1Н4 = 2, see Point B3 and H4 are connected by a straight line. From the point H2 upward delayed 0.8 cm the bottom Line is made of a smooth concave line. The length of the tuck 11 cm, solution tuck 2.5 cm. In drawing foundations introduces the model changes (Fig. 426). Line О1Н2 pattern is cut, the points B1, B3 and B1, B3 are aligned. From the point H4 to the left hem is the cut equal to 2 cm Н4Н5 = 2 cm From the point O upward delayed period equal to 2 cm ОО2 = 2 cm. From point O2 recoverable perpendicular to the vertical, which is delayed a period equal to 4.5 cm, a dot O3. Point O3, B4 are connected by a straight line. The bottom of the bra Cup is made out by the Assembly. Construction drawing of the model (Fig. 423). Bottoms (Fig. 427). Display patterns of the front and rear halves of the bottoms. Applied to the hips. Parallel to the waist line at a distance of 6.5 cm lines are (understatement of the waist), put the points A1, T1. On the front half of the bottoms from the point A1 at the waist line to the left is the cut, equal to 11 cm, a dot A2. At the hip line to the left of the point B is delayed a period equal to the 14 see ББ2 = 14 see Point A2, B2 are connected by a straight line. Pattern is cut and expanded on the value of the build the thighs. Bra (Fig. 428). 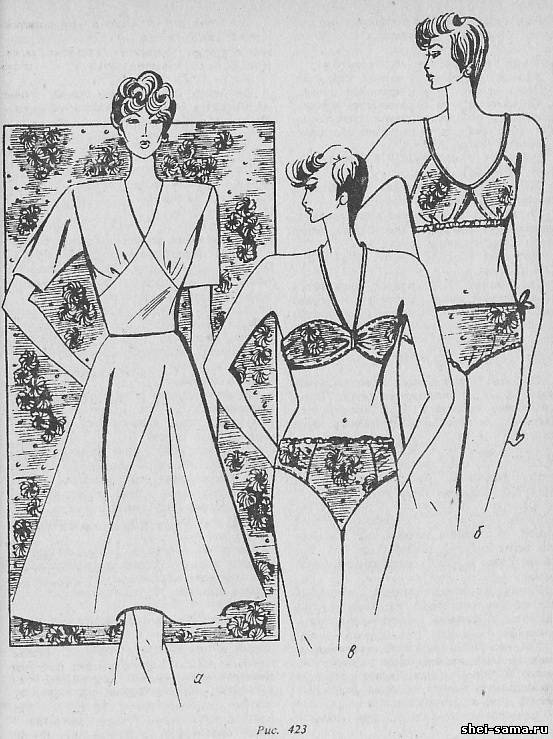 Display patterns of the upper and lower cups of bra. Tuck on the bottom cut closes. At the front and side sections of the brassiere Assembly. 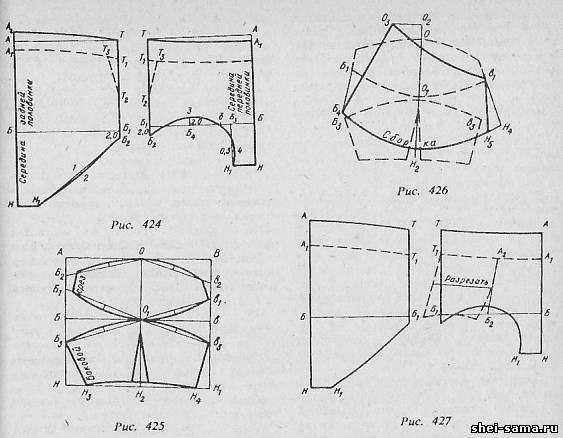 The design of the cups, see figure 428. 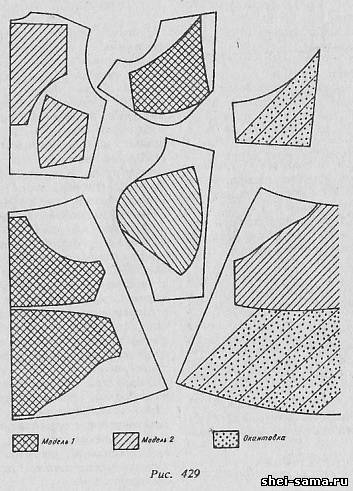 The layout of the details of the cut shown in figure 429.